New York, Henry Schuman, [1950?]. 8vo. xiii, 361 p.,  p. of plates. 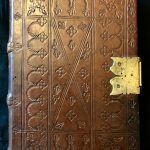 Black buckram, gilt lettering to spine. A near fine copy. Leipzig, Conrad Kachelofen, 17 March 1498. FIRST EDITION. 4to. Gothic letter in three sizes. Double-column text preceded by the “Registrum” with the list of contents. A total of 290 leaves: 281 (=282) leaves numbered in Roman numerals (“folium”…) on top recto of each leaf, plus 8 preliminary leaves (title-page and register). Long 8-line opening title on upper half of first leaf (“Sermon des gross gelarten in gnade[n] erlauchte[n] Doctoris Johannis Thauleri Predigerr Ordens : weisende auff den neheste[n] waren wegk : yn Geiste czu wa[n]dern durch vberschwebe[n]den syn. vnuoracht vo[n] Geistes ynnige[n] vorwa[n]delt i[n] deutsch ma[n]che[n] Me[n]sche[n] zu selikeit.”), 7-line capital space with a large rubricated initial at the beginning of the first sermon, several 3-line capital spaces with small printed guide-letter. 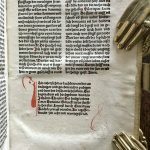 Rubricated throughout with numerous painted Lombard initials added on top of the printed guide-letters in bright red ink. Some occasional offsetting of red ink. Very occasional early marginalia. 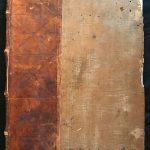 Bound in contemporary blind-stamped pigskin over wooden boards, spine with three low-raised bands covering thick double sewing supports. Original brass clasp and catch, closing on the left board, both decorated with etched sphinxes. Geometrical frames on covers, lines arranged in a hatched or lozenge design within central panels, and imperial eagles tooled within the four square sections formed at the corners. 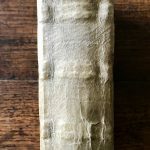 A nicely rubricated and clean incunabulum, only two small repairs to blank foot margins of title and second leaf. A fine copy. FIRST EDITION of both text, published in German. 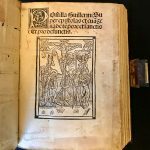 This incunabulum contains 80 sermons by Johannes Tauler (c.1300-1361) and 4 sermons by Meister Eckhart (c.1260-1327), these the first works of Eckhart in print. 1) Early inscription erased on title. 2) Stamp removed from second leaf – we believe it was of Theodor Heuss (1884-1963, first President of the Federal Republic of Germany), based on subsequent owner’s statement. HC *15346; GW M45246; BMC III, 628 (IA. 12345); Goff T-48; BSB-Ink T-62; ISTC it00048000. 4to (19.3 x 14.2 cm. ),14 fols., A8 B6, Gothic letter, 32–33 lines per page. B3 mislettered A3 and bound after the true A3, B4 misbound between A5/6. Occasional light spotting, some repair to blank edges, bound in modern half vellum boards, title on spine. 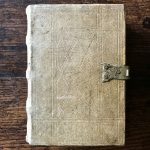 A popular manual for the use of clerics advising on how to carry out the priestly duties in the best way. 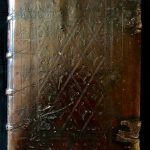 The text is based on the works of the Saints Bernard of Clairvaux and Augustine. This may be a variant issue as comparison by an earlier cataloguer has found differences between ours and the Cambridge copy (see Oates below), which has 30–30ll., showing variations on sigs. B2 and B3. 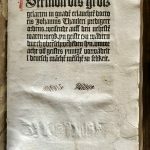 Kachelofen (d. 1528/9) was likely the second printer of Leipzig, and appears to be the first major publisher to set up in the city. His output was eclectic. Goff S 779. Marston p .72. Voullième (B) 1323. Oates 1278. Not in BMC. Oratio in exequiis Cardinalis Tornacensis. Chancery quarto (20.4 x 14.2 cm. ), 6 unnumbered leaves including final blank, clearly integral because it shows on recto an offsetting from the previous page. A good copy in black, white and beige floral paper on boards. 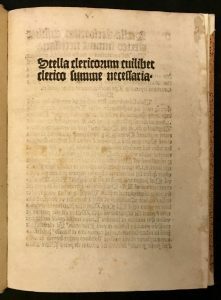 One of two different editions from the same year, of a funeral oration for Ferricus de Cluniaco (Ferri de Clugny), cardinal and bishop of Tournai, who died in Rome on 7 October 1483. Made bishop in 1473 and cardinal in 1480, he was a counsellor or emissary for Philip the Good and Charles the Bold of Burgundy, the Emperor Maximilian and Louis XI of France. His funeral was held on 16 October 1483. Plannck, the printer, specialised in publishing orations given in Rome, in this quarto pamphlet form. The speech-giver, Gianantonio de San Giorgio (1439–1509), was bishop of a suffragan diocese of Milan, and was also a successful canonist and law teacher. He was promoted to cardinal in 1493. Goff S 134. Hain 7597*. Mead ‘Huntington’ 2023. Not in BMC (the BL nevertheless has a copy, IA.18342). 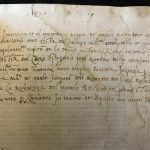 Parma, Andreas Portilia, 8 July 1481. Royal Folio. (40.2 x 28.1 cm. ), A8 B6 C-E8 F6 G-H8 I-L6 M-Y8 Z6 &4 a-f8 g6 2a-2d8 2e6, lacking blanks at beginning and end. Roman letter in two sizes. 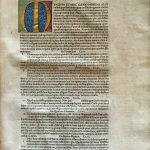 First page of text (A2r) with a very large contemporary lavishly illuminated initial “L” (liquid gold and vivid green, blue and purple colours: a Venetian atelier? 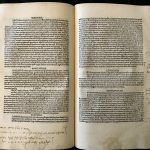 ), spanning the width of 15 lines of text, without taking into account the extensive marginal foliation; at the foot of the same page, an illuminated heraldic shield, unidentified (noble Florentine family of Acciaiuoli? a rampant lion, slightly erased, within a shield at the centre of a laurel wreath on a shell-like blue background with two intertwined cornucopias containing fruits and plant leaves). 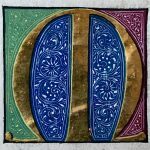 C1r also carries an illuminated initial from the same time. Some light foxing, spotting and staining, particularly to margins, light scattering of wormholes towards beginning, mended snag to bottom margin of last leaf of text, owner’s inscription almost completely removed from sig. a4r and very faded old stamp on recto of rear endpaper. 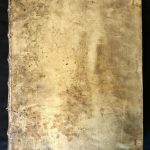 A very good, clean and wide-margined copy, many pages of remarkable freshness, in early vellum (soiled, ties removed, top joint mended). Early shelf mark in ink on verso of initial blank. Contemporary or early marginalia in two hands, especially on the first page of the text. 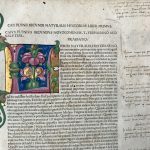 A superb copy of the third Parma edition of Pliny’s Natural History, which was the main medieval source for ancient science. 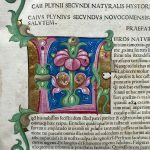 In this work Pliny gives a mathematical and physical description of the world, discusses geography, ethnography, anthropology, human physiology, zoology, botany, mineralogy, sculpture and painting. 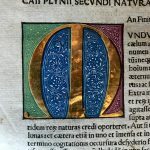 As “a purveyor of information both scientific and non-scientific, Pliny holds a place of exceptional importance in the tradition and diffusion of culture” (DSB). In the present work, Pliny “gives us by far the most detailed account of the coast of the United Arab Emirates that has come down to us. Chapter 32 of Book 6, “beginning near the Qatar peninsula, proceeds to describe the Emirates islands, tribes, and coast right up to the Musandam peninsula, before continuing on south along the coast of Oman”. Pliny “completed his work in 77AD and, to judge from his account of the peoples and places of south-eastern Arabia […], the area of the UAE was full of settlements, tribes, and physical features, the names of which he recorded for posterity” (Ghareeb/Al Abed 54). This book is illuminated for a contemporary Italian owner, and carries contemporary or early annotations by two different hands. 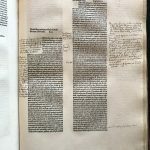 Although this is a wide-margined copy, the books shows signs of trimming, slightly affecting some of the marginalia. 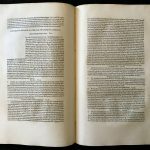 One is a scientific gloss, while the other comprises notes of a philological or historical nature and includes sporadic suggestions for better readings of the text. 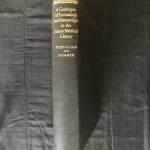 Chapter 10 of Book 28, which deals with medicines from animal origin, in particular wild boars, goats and similar beasts, shows the interest in this topic by one of the early owners who left plenty of annotations. At sig. bb8r (Book 35) there is a reference to the humanist Lorenzo Valla (1405–1457) concerning Pliny’s arguments regarding the deceptive power of painting in relation to birds. 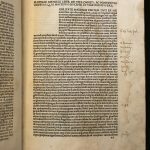 Filippo Beroaldo the Elder edited this incunable. 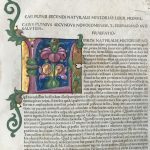 He was a humanities teacher at the University of Bologna and editor of early printed Classics, who normally produced work for the Bolognese publisher Ugo Ruggeri. BMC VII, 937; BSB-Ink P-604; Goff P 793; Hain 13094*; HC 13094; ISTC ip00793000; Oates 2573; Rush Hawkins 339. 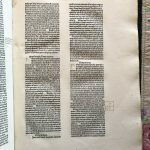 Treviso, Johannes Rubeus Vercellensis, 1485. Folio. 136 leaves. A10 B-Q8 R6. Roman letter. 52 lines, headlines, capital spaces without guide-letters. Slightly trimmed, but good wide margins; thumb marks on lower corner of first leaf; some heavy dampstaining on first two leaves and throughout the first half of the book at foot of pages, no affection the text. Some small wormholes throughout the last three quires, with minimal text loss. Copious early ms. annotations, mostly names of popes for reference. 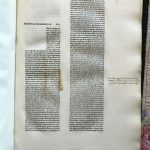 Blank verso of first leaf with extensive Italian vernacular ms. note written in 1522, commemorating the momentous return to Europe of Capitan Juan Sebastián Elcano on the ship Victoria, completing the circumnavigation of the globe for the first time ever in history, which had started three years earlier under the leadership of Ferdinand Magellan who died in the Philippines on the way back from the Pacific. This annotation mentions also the Holy Roman Emperor Charles V as the patron of this expedition. Autograph of C17th owner, the nobleman Lucrezio Palladio degli Olivi, from Friuli (once Republic of Venice), dated “1670” on top of second leaf’s verso. 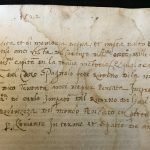 Handwritten foliation; ms. indexing on last leaf, probably by the same early hand that wrote most annotations; loose sheet with C18th ms. list of the following popes, from Paul II up to Pius VI, consecrated in 1775. 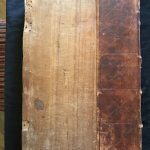 In C18th vellum over thick boards. Ink date to spine plus reference numeration. A lovely copy in good condition. 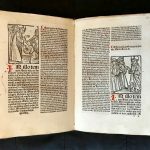 This incunable is the third edition of Platina’s The Lives of the Popes (first printed in 1479). This work is the first systematic handbook of Papal history. 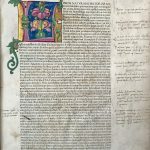 Composed by the Italian humanist, theologian, and historian Bartolomeo Platina and presented to Sixtus IV in manuscript form at the end of 1474, the original copy is still held at the Vatican Library. BMC VI, 897; Goff P770; HC 13048*; Oates 2465; Polain (B) 3188; Proctor 6498. Folio. a-h8.6 i8 k-p8.6 q-r6 (a1r title, a1v blank, a2r Books I-II, r8 blank); s-x8.6 y-z6 (s1 Book III, z6 blank); A-F8.6 G6 H8 (A1 Book IV, H8v colophon and device); I8 K10 (I1r alphabetical index, K10 blank). 232 leaves. 54 lines and headline, marginalia. Types: 1:180G (title), 2:82AG (text), 2:82BG (marginalia). 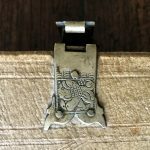 Printer’s woodcut device (Davies 8). 2- and 3-line capital spaces, most with printed guide letters. Later rubrication in quires t-x only. (A few short marginal tears, light dampstaining at end, final blank leaf torn and repaired.) Contemporary German blind-stamped calf over wooden boards, sides with central saltire panel, the compartments decorated with diamond-shaped fleur-de-lys stamps and smaller circular fleurs-de-lys framed with alternating large rosettes and the larger fleurs-de-lys, two brass fore-edge catches on lower cover and remnants of leather clasps on upper cover, lower pastedown from two 13th-century manuscripts on vellum, one relating to a Gospel, the other a scholastic text, title lettered on fore-edge (rebacked preserving original backstrip, front endpapers renewed); numerous deckle edges preserved. 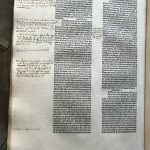 Copiously annotated in a small neat cursive hand, apparently by a single contemporary owner, a second hand appearing in Book IV, chapters 31- 32 (F1-F2). A note on the title by the principal annotator clarifies the difference between Petrus Lombardus and Petrus Comestor (according to legend they were brothers), explaining that one was the commentator of the Psalms and Pauline Epistles, while to the other was due the history of the [early] church. 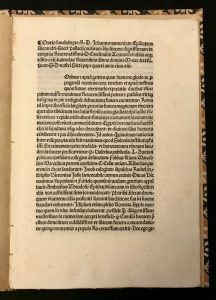 After first encountering opposition and attempts at censorship, Peter Lombard’s Sententiae became the standard textbook of Catholic theology during the later middle ages. 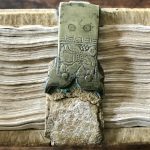 This is the probable seventh of 21 recorded fifteenth-century editions. 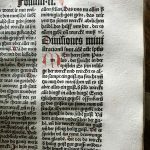 At the death of Bernhard Richel in 1482 his son-in-law Nicolaus Kesler, or Kessler, a native of Bottwar, took over the press. 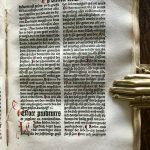 Under Kesler’s management the shop became one of the most important in Basel, making use of a rich variety of typographic material, and printing predominantly theological, homiletic and canonical texts, along with a few humanist works. This copy was part of the Nakles Collection (Christie’s, New York, 2000). HC 10190*; BMC III, 763 (IB. 37573); BSB-Ink. P-382; CIBN P-241; Harvard/Walsh 1204; Polain(B) 3117; Pr 7654; Goff P-484. Quarto. 162 unnumbered leaves, A-M8 N6 a-f8 g-h6, including two blanks (fols. (n6) and  ((final) h6)). Gothic letter. Floriated initials, capital spaces with nicely rubricated guide-letters, rubrications throughout. Title-page with large woodcut of Crucifixion, 52 smaller woodcuts in text. Some light soiling and staining, a few wormholes to blank margins towards beginning, fols. (k1) and  (k8) re-margined in blank (the latter also with a small paper flaw, affecting two words on verso), fol. (k4) with repair to blank outer margin, overall a good copy. 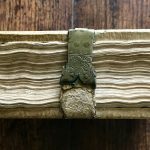 In original blind-stamped calf over wooden boards with vellum bifolia of fifteenth-century breviary as endleaves. 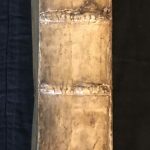 Large brass clasp, rebacked, cracks to spine, small tear to head. Contemporary ownership inscription on f.f.e.p. recto. A fine copy. Illustrated guide to the excerpts from the Epistles and Evangelists read at church services throughout the year (the Lessons). 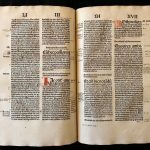 The text was first issued in 1437. 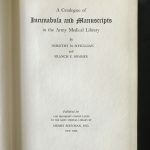 The importance of the book is shown in the fact that more than 100 incunabular editions were produced (if a reasonable estimate of 400 copies per edition is accepted, this suggests over 40,000 copies in circulation!) 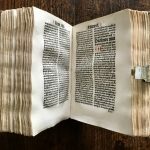 The book’s naïve woodcuts, some of considerable charm, appeared in a Basle edition of 28 July 1491. The ‘British Museum Catalogue’, describing this earlier printing, suggests that the pictures were copied from earlier Lyons editions. 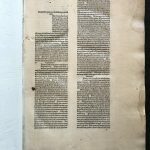 Schreiber, writing about this present edition, suggests the influence of the Strassburg ‘Plenarium’ of 1482. Goff G 682. BMC III 770. Schreiber 4147. Hain 8279. 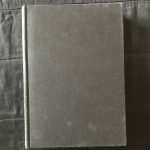 The Kraus copy, Catalogue 182, number 85. Folio. a-d8 e6 f8 g6 h8 i6 k8 l-m6. 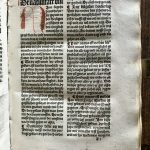 Gothic letter in two sizes on thick paper, 54 lines and headlines, capital spaces with printed guide-letter and large ms. rubricated initials. Opening page with 4-line initial in blue on punched gold ground, floral decoration in lower margin, red underlining to very first lines of text, and ink underlining throughout. 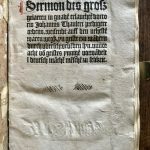 First quire extensively annotated by an elegant early hand; ms. list of feast days on rear endpaper — Au am Inn, monastery S. Felicita (early title inscription). A few letters supplied in ink ms. on a4, some scattered worming mostly marginal but touching text in a, k-m, light dampstain towards the end. In contemporary German blind-tooled calf over wooden boards, sides panelled with foliate rolls and various foliate stamps. Somewhat worn, sign of restoration, re-backed, without clasps, small wormholes, but generally fine. A copy in good condition. 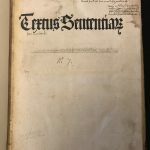 This is the second incunabular edition of Saint Augustine’s On the Trinity. It includes fifteenth books discussing God and his three-folded nature, according to the Christian faith. This Latin Father of the Church, who lived in the fifth century in Northern Africa, had a great influence on the Christian thought of the later centuries. 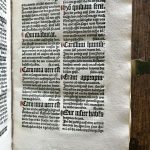 Amberbach printed this and two other works by St. Augustine in quick succession; on the basis of their success he embarked on his ambitious project of printing the entire Augustinian corpus, completed in 1506. HC 2037; BMC III 751; GW 2926; BSB-Ink A-877; Bod-inc A-561; Goff A1343; ISTC ia01344000. 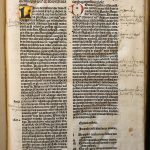 ARISTOTLE (Comm: Averroes; Ed: Nicoletus Vernia). 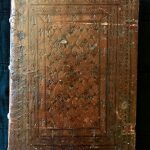 Opera: Praedicamenta, De interpretatione, Analytica priora (Tr: Boethius). Analytica posteriora (Tr: Jacobus Veneticus). Topica, Sophistici elenchi (Tr: Boethius). 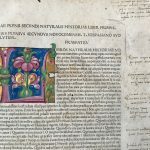 Add: Porphyrius: Isagoge in Aristotelis Praedicamenta (Tr: Boethius). 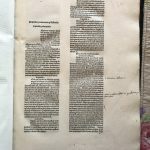 Venice, Andreas Torresanus, de Asula and Bartholomaeus de Blavis, de Alexandria (in part for Johannes de Colonia), 1483. FIRST EDITION thus. Royal Folio. 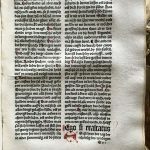 117 leaves (of 118, lacking only blank q10), a-b6 c4 d10 e6 f10 g-k6 l8 m6 n8 o-p6 q10 r8, double column, gothic letter in two sizes, 66 lines and headlines, initial blank spaces, beautiful woodcut printer’s device printed in red to final text f. (r8). Occasional early ink marginalia throughout, extensive annotations, neat and clear, on the first leaves of the Posterior Analytics (K5, K6 and L1); lightly browned and stained, a few wormholes, affecting part of one or two letters on several ff., occasional foxing or spotting, a few stains, some marginal repairs, especially to upper gutters, old wooden boards, re-backed in antique style calf, lacking clasps, upper corners of boards worn, some worming, rubbed. A fine and clean copy overall, with wide margins. Rare. 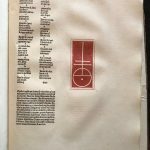 First in a series of separately issued parts of Aristotle’s Opera by the Venice-based printers Bartolomeo de Blavis and Andrea Torresano. A pupil of Nicolas Jenson, Torresano was Aldus’s son-in-law and became his collaborator from 1508 onwards. Averroes was an Andalusian Muslim polymath. Some consider him the founding father of secular thought in Western Europe, who played an essential role in contributing to the transmission and understanding of the thought of the great Greek philosopher. 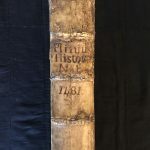 His thorough commentaries upon Aristotle’s works have informed the medieval scholarly traditions within the European universities and the theological elaborations of Scholasticism. Goff A962, GKW 2337. Renouard 284:3. Stillwell, Awakening Interest in Science 736 n. Klebs 82:2. Bernoni 271:14 “importante edizione”. Not in BMC XV.